If you have that one laptop that has been with you through thick and thin for many years put up your hand. Thanks. Put it down. I was not going to write about my laptop journey but then I turned on this thing only for it to shut down after ten seconds. Reason? Battery. It is now a desktop. I can only use it when it’s connected to power. Another handy trick that makes it last for a few minutes is charging removing the battery while it is connected and then putting it back. It’s annoying. I am not about to get a new battery. Why? This is the second battery to have served this laptop. The first died the same way. I have had this trusty computer for about 5 years. It actually turned 5 last week. 5 years is a short time really. It’s a Toshiba Satellite C650. Yeah, I know. Obsolete. Pentium Dual-Core. I remember the first day I got it. I was super excited. I was in my second year of campus. Dad got it for me after I nagged for like one day. I needed a laptop, if not anything else. To stop hanging out in friends’ rooms watching movies on their computers. To stop this from being mistaken as being in love with the said owner of computer. To be able to undertake a lot of writing, both academic and side hustle-like. At that time, there was this project dubbed Wezesha where laptops were subsidized by the government. Everyone acquired laptops in campus. Everyone filled the library with them, to hog the Wi-Fi. Nearly everyone lost laptops to thieves. For this reason, my laptop spent most of its waking moments on my lap or my back. I had this huge Swiss bag that was pretty much bigger than me. People made fun of it a lot. I was the girl who walked around with a huge bag. I remember someone else in school had the same bag, but since he was taller than me, it looked perfectly fine on him. But you know what? I didn’t care that much. I was not going to lose my bread and butter over a few taunts. When I left it in the room, when I absolutely had to, I would hide it either under many many beddings and clothes. That’s if I was leaving for a few minutes. If I was leaving to Eldoret town, for instance, I would leave it in my suitcase which was on the top compartment of my wardrobe. And then there were those things we called antigens. LOL! Antigens. Like seriously, we called those things antigens. I don’t know why but this is suddenly very funny to me, in retrospect. Biology 101. I first encountered antigens in Moi University. In case you don’t what this is, an antigen is a kind of lock you add to the existing keyhole to ensure it is sealed from the millions of other keys which open more than one door in campus. So on top of hiding the laptop in various spots in the tiny room, I would also lock the door and seal it with an antigen. Despite all these efforts, people would still lose their laptops. You would walk to the toilet, thinking that was a short time for anyone to grab it from your bed, and you would come back and find it gone. I suspect “friends” stole from “friends”. Shiku-PC almost plunged to its death a few years ago, but the universe saw it fit to keep it going for a few more years. I have never liked its speakers. It also makes more fan noise than I would like. Its DVD player works when it feels like. Everything else is intact. It has so many movies I cannot delete because I am overly sentimental with good movies. Too attached. Same with pictures and documents. All my blog posts from the earlier years are here. That’s until I moved to the cloud. Ahem. Thanks Google Docs. When I compare my phones and this laptop, I’d rather lose the phone many times over. It’s old. It’s dusty. Never done that blowing thing that every dude that pretended to be an expert in comps recommended. It’s obsolete. It’s mine. I think it will be hard to just forget about Shiku-PC. Let me stop there before I cry. Yeah. It once helped me dry my wet socks. Don’t ask. Just like the fluorescent bulbs in high school! 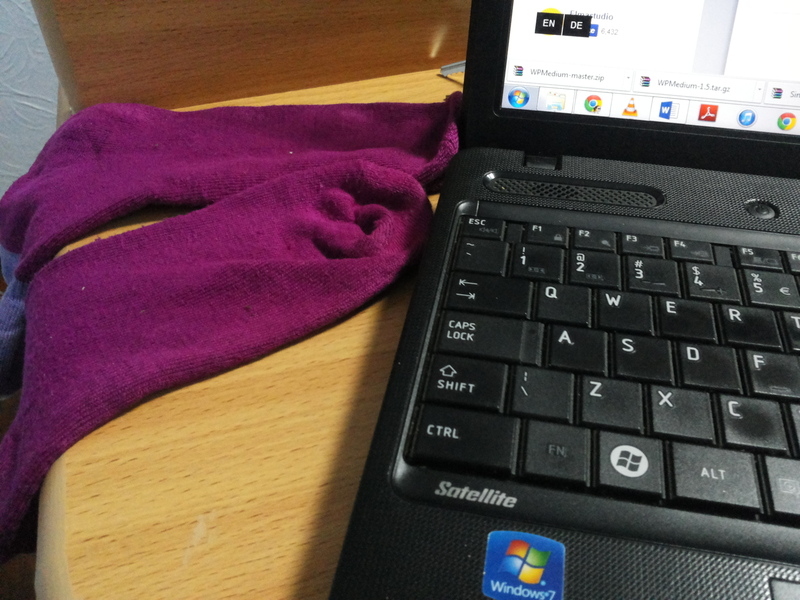 Shiku dries her purple pairs of socks using the hot air that blows from the turbines that serve as fans for her old, dusty laptop (which doubles as a portable heater)… After all who needs the sun? Why didn’t I think of that? Because the reason the socks were wet was because it was bright and sunny outside! I will tell you about my laptop too. See you online. The laptop that never sleeps! Wish I held on to my P.C.. handed it down to my Lil bro who did not care much for it. Are you writing about the socks next,i actual thoght there would be something about them in this post when i saw the Picture. Ha! Get out of here, Penina.